If you’re interested in getting into the S&P 500, it seems like a good time to do so. Earnings are rising, GDP growth is strong, the unemployment rate is falling, and wages are heading upward. There’s just one problem: as I wrote a few months ago, the S&P 500 is a lousy bet. There are a couple reasons why, the biggest being the income problem. If you buy into the SPDR S&P 500 ETF (SPY) or the Vanguard 500 Index Fund (VOO), you’re going to get a dividend yield of less than 2%. So buy $500,000 worth of those funds and get a whopping $791 monthly in cash dividends. 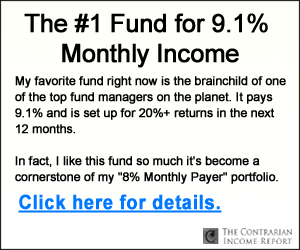 Today I want to show you 3 funds that yield over 9%, on average. Buy into this trio with $500,000 and you’ll get $3,837 in monthly income. Now that’s more like it! The best part is that these funds provide this higher income stream without taking on much more risk than SPY and VOO. In fact, all three invest most of their net asset value (NAV) in S&P 500 companies. Let’s look under the hood and see how they’re paying those outsized dividends. The first fund I want to show you is called the Liberty All-Star Equity Fund (USA), payer of an amazing 9.5% dividend. 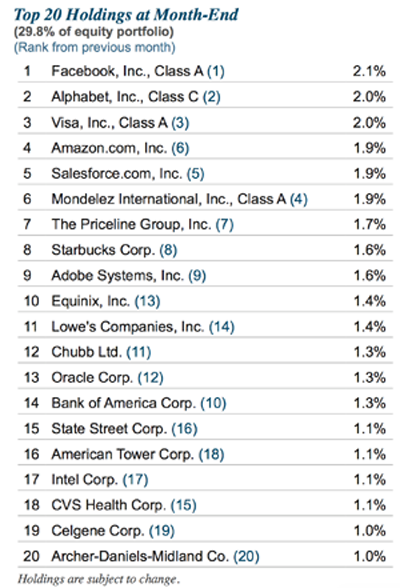 Its top holdings are a bunch of familiar NASDAQ and S&P 500 favorites, with top performers like Facebook (FB), Alphabet (GOOG), Visa (V) and Amazon (AMZN) at the top of the list. By allocating its $1.2 billion in net assets to these companies when they’re undervalued and rebalancing when the stocks get overvalued, the fund enjoys capital gains it can then send out to investors as dividends. Think of it as an automated, simplified way of buying a big basket of stocks, selling some after a run-up and buying others when they’re relatively cheap. This is the kind of careful value investing that has made moguls like Warren Buffett billionaires: buying low, selling high and managing a portfolio of cash-generating stocks. You can do this yourself, of course, by studying financial reports on dozens of companies, listening to their earnings calls and creating your own discounted cash flow models to set target buy and sell prices. That’s certainly a better option than passive index investing, as I wrote back in February. But if you want to save yourself a lot of legwork, you can just buy USA and let the experts do it all for you. Another strong fund comes from Mario Gabelli, the value-investing legend who runs Gabelli Funds. You may have seen Gabelli on Bloomberg or CNBC. He gets interviewed a lot because he’s considered a master of the Graham-Dodd school of value investing that’s also the secret behind Warren Buffett’s massive wealth. Gabelli has used this approach to build a huge investment empire and make his firm one of the world’s most influential mutual-fund companies. 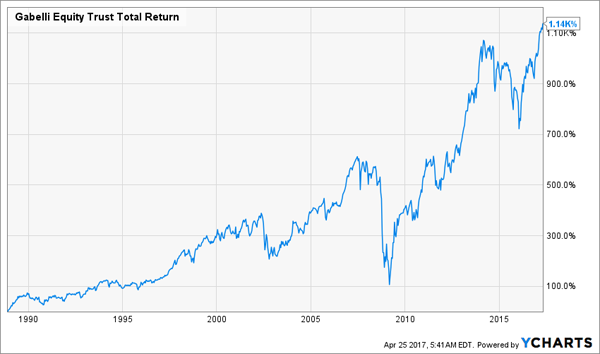 A 1,140% return? Not bad! 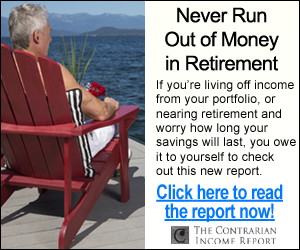 What’s even nicer is that you’re going to get $82.50 per month in dividends for every $10,000 you invest in the fund. That’s a tremendous cash-generating machine, thanks again to the fund’s high-quality portfolio, including top holdings Rollins (ROL), the pest-control specialist and Orkin parent company, Honeywell International (HON) and American Express (AXP). Oh, and Gabelli has invested $28.3 million in Berkshire Hathaway (BRK.A), so you’re getting a piece of Buffett’s brilliance too. You’re also getting paid huge dividends for the pleasure. My third pick comes from Nuveen Funds, a massive investment firm with a variety of investment products for everything from municipal funds to real estate and beyond. 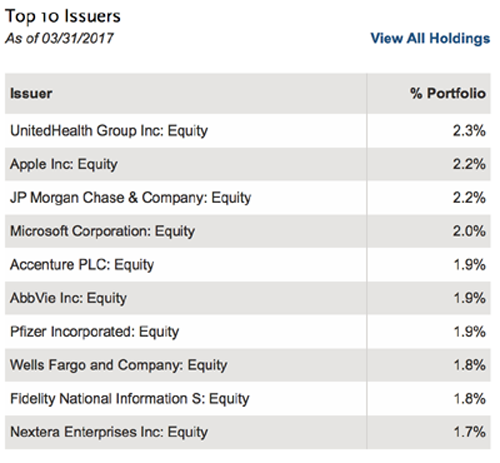 Nuveen also won 10 Lipper awards in 2017—those awards, which are doled out by Thomson Reuters, are restricted to the best investment funds in the world. Although Nuveen is more famous for its municipal-bond funds, which tend to be great, it also does excellent work in the stock market, even if that tends to fall under the radar. The company’s Nuveen Tax-Advantaged Dividend Growth Fund (JTD) takes a sensible approach, buying high-quality dividend-paying companies when they’re undervalued and selling when they’re overvalued. JTD also hedges this investment in a variety of ways to make it even safer. First, the fund uses call options to lower its downside risk (essentially insuring its investments against a market correction). It also diversifies by buying a few preferred stocks that pay higher yields and have less price volatility than common shares. On top of that, JTD manages its portfolio to lower your tax liability by focusing on long-term capital gains and qualified dividend income—both of these have lower tax rates than short-term capital gains. If you try to replicate JTD yourself, you’ll invariably face that higher tax rate, so this is a great perk to have. USA, JTD and GAB are all solid investments, but they don’t stack up to my 4 favorite CEFs. Right now, these 4 cash machines throw off rock-solid 7.6% payouts, on average, but here’s the kicker: they pack a far bigger capital gains punch than any of the 3 funds above. That’s because all 4 trade far below their historic discounts to NAV—or the value of their underlying assets—than the CEFs I told you about above. And as those unusual discount windows slam shut, I fully expect all 4 to set off on a wild upward ride that will tack on 20% gains—at least—in the next 12 months! Tack on their 7.6% (and higher) yields, and we’re talking about easy 30%+ wins here. And you’ll take a nice chunk of that gain home in cash. But the discounts on all 4 of these hidden gems are closing, so time is short. Don’t miss out! Click here to get the names of all 4 of these 30% winners now!